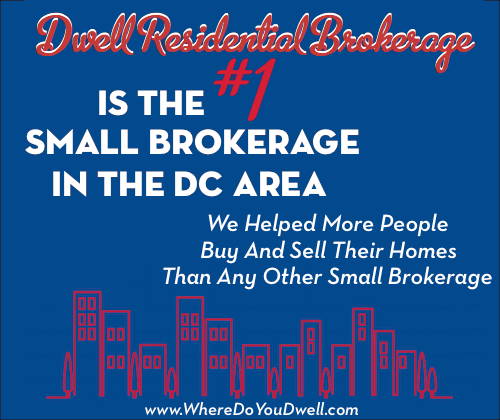 Spring selling season is “smelling like roses” for both buyers and sellers as the DC Metro housing market posts strong numbers again. It’s been a busy time with prices, contract activity, and inventory showing positive increases, according to an analysis of data from May by RealEstate Business Intelligence (RBI). · Prices at highest May level since 2005 – a full decade! 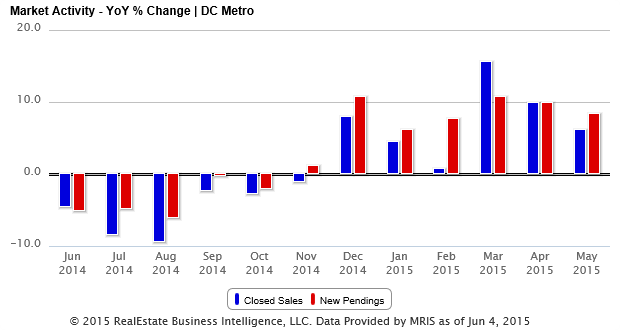 Closed sales experienced the sixth consecutive month of year-over-year increases. The total of 4,835 closed sales exceeds the 5-year and 10-year average. All market segments – single-family detached homes, townhomes, condos – showed growth in year-over-year sales, with townhomes rising the most at 15.3% and condos at only a one unit increase compared to May 2014. Looking at the jump from last month, single-family detached homes experienced a 19.2% increase in the number of sales from April to May. New contracts reached their highest May level in over a decade. New contracts have risen in May for the last 7 years – with the total at 6,158 in May 2015. Townhomes showed the largest year-over-year increase at 10.2%, with condos taking the rear with a 3.4% increase. 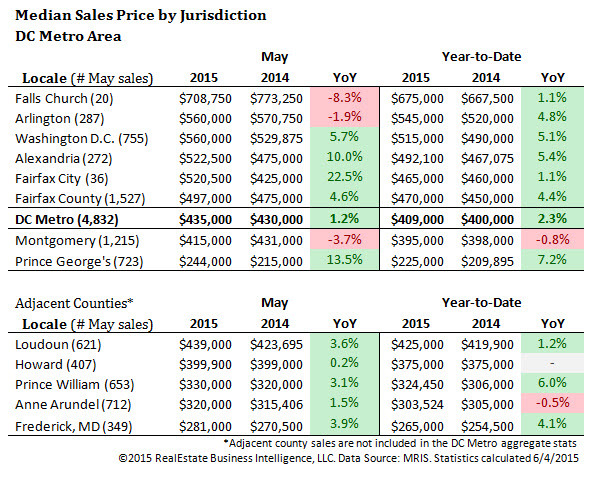 The median sales price of $435,000 was the highest May level in a decade – a $5,000 increase over May 2014. Not all individual market segments experience an increase – condo prices went down 1% to $307,000 and single-family detached homes declined 2.3% to $540,000. Townhomes were up 1.7% to $427,000. Sales volume was up 19.3% compared to May 2014 – ringing in at $2.5 billion. Year-over- year price changes in jurisdictions were mixed — with the District, Alexandria, Fairfax County increasing while Montgomery County and Arlington showing slight declines. Distressed sales were down across the region. Most of the 266 foreclosures were in Prince George’s County (192) and Montgomery County (118). Active listings continue to rise and have increased for 20 consecutive months. There were 12,083 active listings at the end of May, a 15.8% increase from last year and a 11.3% increase from last month. Condo inventory takes the lead with a 21.1% increase, townhomes up 20.8%, and single-family detached homes at 12.2%. Fairfax County at 4,256 and Montgomery County at 3,330 have the largest number of active listings. New listings increased 3.6% from last year, with townhomes with the most at 10.5%. New listings are down 438 or 5% compared to last month. The median DOM at 12 days is lower than the 5-year of 16 days and the 10-year average of 24 days. 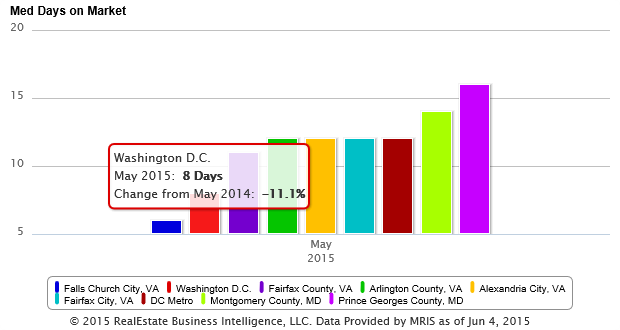 Washington, DC had the lowest number of DOM of 6 days, same as one year ago with PG County with the highest at 16 days, down from 19 days in May 2014. Townhomes have a median average of 10 days; condos at 15 days; and single-family detached homes at 12 days.